Need help with setting up or running your machine? Below are some of the questions we get asked regularly. 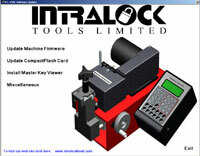 If you have any other enquiry or need to speak with our Technical Support team, please email: techsupport@intralocktools.com or call us at: 1- 888 - 264 - 6627 (toll-free) during our office hours of 8am - 4:30pm Pacific Standard Time. / How do I install and wire my ITL 950/950C unit for mobile use? Follow this simple procedure: For personal safety and minimized risk of damage to your machine, you must first ensure the machine is fastened securely. Use the two threaded ¼ 20 bolt holes provided in the base for mounting. For your convenience, a template is supplied with the box your machine comes in and should be used as a guide for drilling into your countertop. When everything is secured, locate the 2 12 volt cable connectors at the back of the casing. They will be red (Positive) and black (Negative). What gauge wire should I use? Use number 8 gauge wires or thicker and install an inline 20 amp fuse at the power source. What length should the wire be? Use the shortest length possible to a maximum of 20ft. Otherwise, voltage drops may be experienced and may result in improper functioning of your machine. Should I use stranded or solid core cable? A stranded cable is easier to handle. Is it better to use connectors or no connectors? Always use connectors. What is the peak amperage on 12 volt? 10 amp pk. Tip: An auxiliary battery with an isolation module is recommended to avoid running down the truck battery. / What cutters should I use? What cutters come with which machine? ITL key machines accommodate a wide range of cutters to allow users to do more. Below shows the available cutters, their purpose and which ones come with which machine as standard. Cutters are available in stores and can also be ordered from the ITL Factory. If you'd like to order a cutter from us click here and specify the Cutter Type and the Part No. / What software can I use with ITL Machines? / How often and when do I have to update key codes? This depends on what types of keys you cut regularly. The likelihood of an update is higher if you need to cut mainly car keys since car manufacturers are always adding new locks for new models. If it's been a while since your last update, please email us or phone 1-888-264-6627 to purchase an update. Be sure to have the serial number of your machine handy, too. / Which Code or Program Version exists on my machine? Ensure the machine is on and in Ready mode. "1", followed by "mfg" followed by "Depth". This is an example of what you'll see on your screen. Your code version is: 2.05 Release 2. Push the CLEAR key to return to Ready mode and to resume with your key cutting. Push these keys in the following keys in sequence: "-", followed by "9" followed by "mfg". Your Program Version will appear just after the make of your model. In this case it is V1.12. A patchfile may need to be downloaded. Step 1. Browse the contents on your CD Drive folder - depending on your system, you can use Windows Explorer, My Documents or Start/Run/Browse. Step 2. In the Frameworks folder, open the dotnetfx patch-file and choose "Yes" to install. Step 3. Return to the main CD Drive folder and double-click on the itlStart.exe file. For convenience, the Plunge Mode has been pre-set for certain ITL Manufacturer numbers. Please click here to view which ones they are. (Applicable to software updates purchased after November, 2007). / I was trying to cut a key and my ITL 950/950C just quit running. What do I do? Step 1. Unplug the machine from its power source. Step 3.Locate the fuses: The fuse on the switch side is a 2-amp slow blow that protects the line from internal shorts. The other is a 10-amp slow blow that protects the cutter motor. Switch off the machine and unplug from the power source. Unscrew the 4 x Phillips screws at the bottom of the control head to reveal your calibration numbers. (See right). Write down their numbers. Reassemble. Turn on your machine. When in Ready mode press the keys –, 8, mfg to display current space setting. Press mfg again to show the current depth setting. 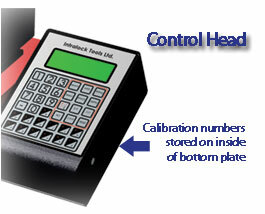 If the results read space ABS 1350 and depth 450, the computer has returned to the factory default and the numbers for the machine must be re-entered. Press mfg to view the current depth number and press mfg once more to install the new depth calibration.